Earn FREE Gift Cards with shopkick & $10 Off at Old Navy | A Savings WOW! Do you like earning free things when you do the things you normally do, like shop? You will love this FREE shopkick app! We love using it because it’s so easy to use and it makes shopping even more fun! We plan to use the rewards towards our holiday shopping! shopkick is an app that you can download on your iPhone or Android phone. You can download for the app for free from the shopkick website. Get 50 free kicks (points for rewards) when you use our invite code squirrel9564 upon signing up! 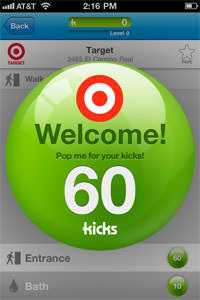 – You can earn kicks just by walking into the store. You’ll see how much each “walk-in” will earn you. All you have to do is stand in the entrance, launch shopkick, select the store, and wait for it to register your points. This is one of my favorites, especially when it’s a store we regularly shop. – You can get exclusive deals delivered straight to your shopkick account. For example, right now, they have an EXCLUSIVE OFFER of $10 off your purchase of $40 or more coupon at Old Navy (through November 13th). All you have to do to redeem it is to show your phone to the cashier when checking out. PLUS, you will get 150 kicks just for walking into Old Navy. – You can earn kicks by scanning specific products. It will tell you when you select a store if there are any “Scans” available. Once you click on the item to scan, it will activate the camera on your phone to be able to scan the barcodes. – You can also get more offers, deals, and extra kicks by selecting “Instant Surprise.” This is super-easy and sometimes you can even earn kicks from the “Instant Surprise” without having to physically be in the store. * These are the rewards showing up in our shopkick account as of today. They may change at any time. Sign up for shopkick today and get a 50 FREE kicks (use invite code squirrel9564)!